About six months ago, we started making chocolate out of a cacao from a farm and fermentary in Ecuador called Camino Verde. Internally, it’s become a bit of a favorite, but our café manager Jenna had an experience that prompted a deeper dive into the beans’ chemical makeup, inspiring a love letter to the chocolate itself. From my culinary career, I recall the things that made me really stop in awe of their simplicity and power: oysters, anise, egg yolk, white soy sauce, cheese—things that are imprinted in my mind for the way they make me feel when I eat them. When something makes you stop dead in your tracks and pay attention, it makes you remember with your whole being. I was struck by this feeling—for reasons I couldn’t identify—the very first time I tasted the beans from Camino Verde, a farm and fermentary in Ecuador. As a 70% bar, the chocolate from Camino Verde is interesting: chocolatey in a classic way, but simultaneously particular, and characteristic of a single origin chocolate bar. It’s easy to like. The day that I tasted the 100% Camino Verde bar, though, a part of me shifted. This is 100% cacao. No sugar. It’s a different animal. As I tasted and ate, there was an overwhelming feeling of heat and excitement in my brain. Yes, I felt it in my brain. The saturation of flavor on my palate was intense: sunflower butter, hearth baked sourdough crust, and most importantly: chocolate. I became addicted to the experience of eating it. But how could I explain it? What made that feeling happen? Fortunately for me, there is some very compelling science that validates my admitted addiction to this bar. Greg D’Alesandre, our Chocolate Sourcerer, sent the beans to Adam Kavalier Ph.D—a plant scientist and the man behind Undone Chocolate in Washington D.C.—to get some chemical testing done out of curiosity. Camino Verde ranked peculiarly high on a few of these tests, as seen below. Palmitoylethanolamide (PEA) – a fatty acid that has been shown to bind to brain receptors, inhibiting chronic pain and inflammation. This compound has been shown to have a similar effect on the cannabinoid receptors in the brain, is an anticonvulsant, and has neuroprotective properties. Theobromine– derived from theobroma, the name of the genus of the cacao tree. It is a basic nitrogen- containing compound found in chocolate, tea leaves, and kola nuts. Has a similar but lesser effect than caffeine. 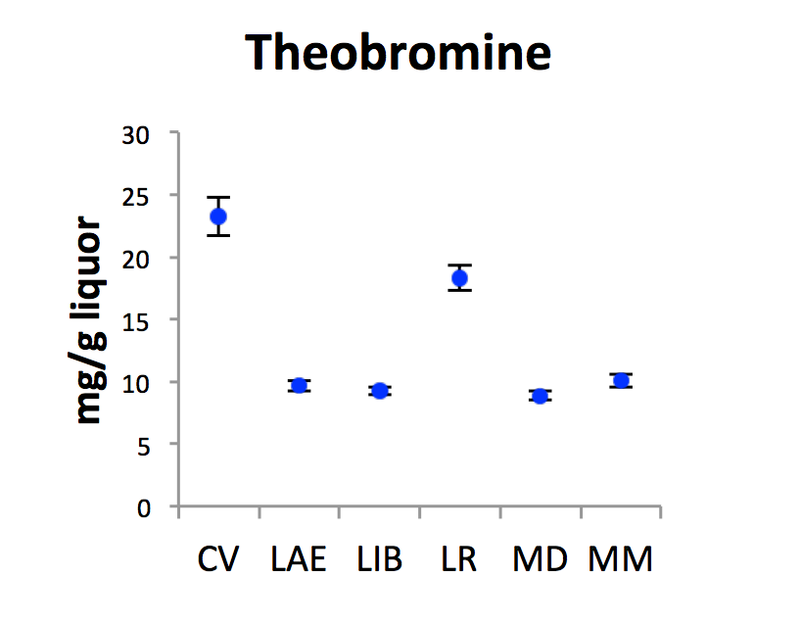 Theobromine also impacts HDL (good cholesterol) and LDL (bad cholesterol), increasing HDL and decreasing LDL oxidation, basically improving the cholesterol profile. Interestingly, theobromine content naturally diminishes the longer a bean is roasted, which suggests that the the Camino Verde—which we roast on the longer side—must have an even more impressive amount of theobromine than this chart shows. Procyanidin– a condensed tannins class of flavonoids. 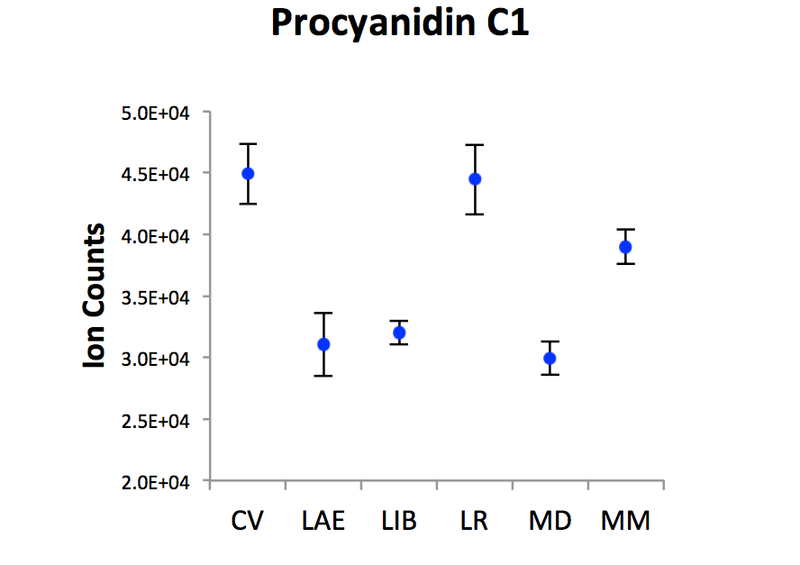 Procyanidins are the principal vasoactive polyphenols in red wine that are linked to reduced risks of coronary heart disease. The antioxidant capabilities are 20 times more powerful than vitamin C and 50 times more potent than vitamin E. Check out the results for Camino Verde (CV) and La Red (LR) on this one-— pretty epic. 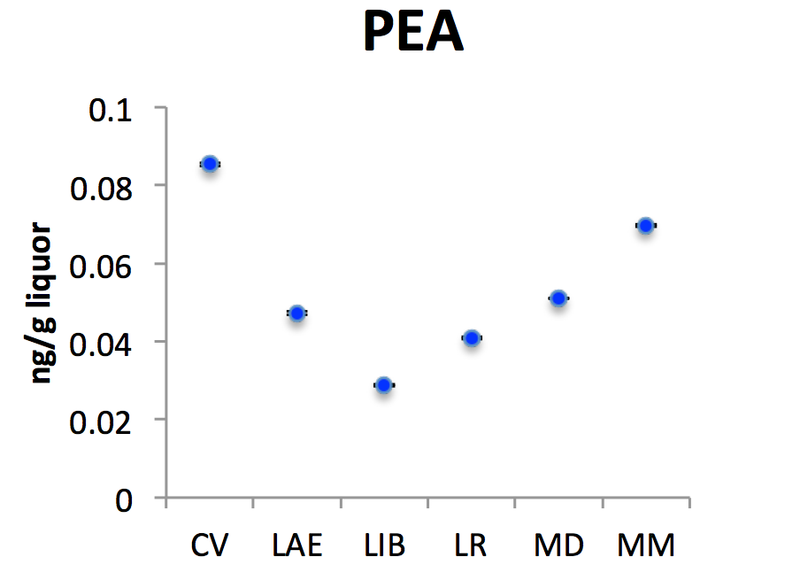 Also interesting to note: I haven’t found a published study that indicates there is a dose limit that your metabolism is more or less effective at handling of PEA fatty acid. Maybe I could be a first test subject?! On the other hand, a reporter for Men’s Health—Aaron Gilbreath—recently ran an experiment on himself and chose to eat nothing but chocolate for an entire day. Aiming to match his typical calorie intake through chocolate, Aaron consumed a wide variety of bars but ended up cradling the toilet. Adam’s lab also identified oleoylethanolamide (OEA) in the cacao, which is especially interesting because it is a neurological compound, an one of the reasons that you cannot overdose on cacao—because the body tightly regulates its accumulation of these naturally occurring compounds in the blood. So, try as you might, there’s only so far you can go. While I can’t be certain how much of my experience was a direct reaction to the compounds in the bean, it’s exciting to find at least some evidence that may help to explain my experience. There is much research to do, but if we were to hypothesize what compounds contributed to the feeling I got, we’d point to theobromine, which is thought to cause a heightened neurological experience, and PEA, which contributes to a sense of wellbeing (incidentally, it is the same adrenal-related chemical that our bodies produce when we are excited, or falling in love). It has also been shown to increase anandamide activity in the brain. Even the word “anandamide” comes from the Sanskrit word ananda, meaning “bliss,” and anandamide has been popularly pegged the “bliss molecule.” Inside the body, anandamides are cannabinoid neurotransmitters produced by the brain that activate the same receptors as THC. The molecule itself has a similar structure to THC, and both of them slip easily across the blood brain barrier, producing different elevated states—anandamide’s being more mild and short lived. So, there’s that. 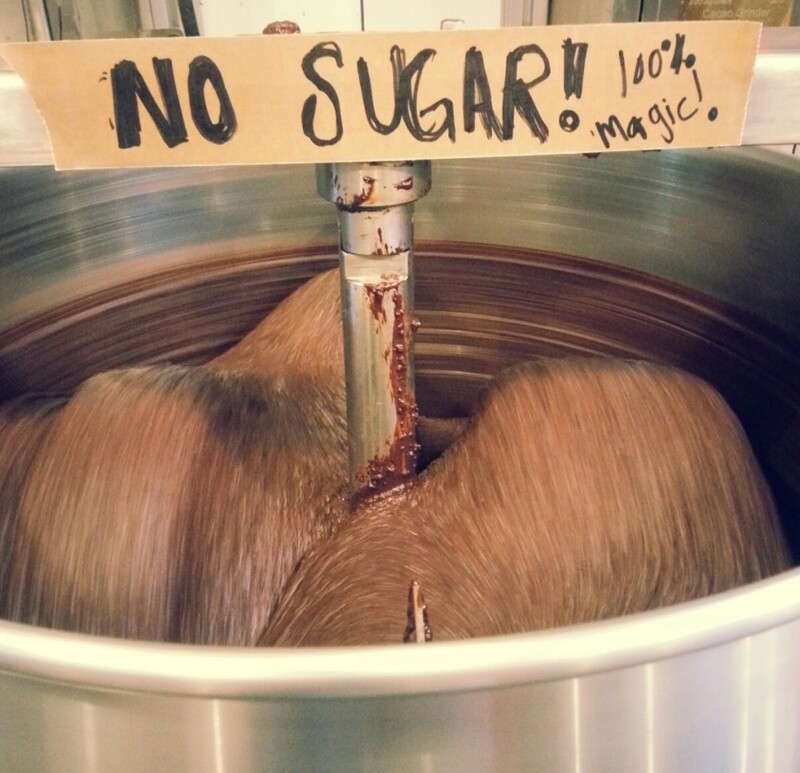 Even a little bit of sugar changes the way a certain cacao tastes, and chocolate without sugar at all is an entirely different thing to behold. So many things influence the taste of chocolate, not least of which is cultivation and fermentation. Vicente Norero—a farmer and the proprietor of the Camino Verde farm and fermentary—takes an approach to fermentation that is uniquely controlled, draining the cacao pulp from the beans and reintegrating it with carefully measured mixtures of microorganisms. Sometimes, it’s the little things that make the biggest difference.